A fabulous and extremely spacious 1 bedroom flat boasting a bright reception room and a stylish eat-in kitchen, this lovely flat is in excellent condition and is light and airy throughout. Abbey Orchard Road is perfectly located for the sights, shops, restaurants and bars of Westminster, Whitehall and Victoria as well as St James's Park. 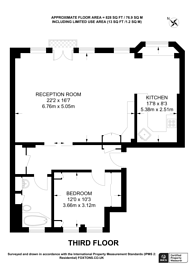 The nearest public transport links to the flat is St James's Park Station.